Wakka, the purple Grundo, crept silently through the Haunted Woods. "Quiet... too.. quiet..." she thought to herself. She held out a dimly lit lantern, scrunching her eyes to see through the thick darkness. She could hear the faint hissing of a devilpuss somewhere in the distance, and the spooky echoing of the haunted fairgrounds just past the edge of the woods. Vaggendotra 5000, (Dotra for short) her faithful companion, was at Tangor's Workshop having some repairs done. Wakka was feeling quite alone at the moment and wished she had waited for him to come along. A gust of wind picked up making little bumps stand out on her skin and the tiny hairs on the back of her neck stand up. It felt as though the unexpected wind was pushing her forwards towards the fair. "Okay Wakka, you're being silly... It's just the wind. You WILL find an amazing, terrifying, awesome costume for Halloween this year!" she murmured into the darkness. She knew she was close to the fairgrounds when she could make out the cackling of the Brain Tree. Wakka had made the mistake of trying to help it find some items last year and it had cost her a fair amount of points to learn just HOW evil the Brain Tree could be! Wakka jumped what seemed like ten feet into the air when as she felt something brush past her leg. She looked down to see an innocent enough looking sludgy peering up at her hopefully. Wakka reached into her pocket, pulling out a pumpkin cookie as she caught her breath. She tossed the cookie to the little sludgy, and wiped the brown slimy residue it had left on her skin onto the bottom of her shirt. "You're not so scary, are you?" The sludgy opened it's mouth and swallowed the cookie whole, making a slurping noise in appreciation. She walked through the maze of tombstones, creaking wrought iron gates, and jack-o-lanterns, towards the now audible music of the fair. The sky lit up with lightning and the storm that never seemed to leave Castle Nox. That place was REALLY haunted, and it gave her the creeps! She shuddered again. "Okay Wakka, just get an AMAZING costume, and GET OUT!" she whispered to herself. Just then she heard a chuckle and turned to see who it was. The laughter was coming from a Gnorbu who wore an old, tattered, worn looking vest and hat and was leaning against a stand of some sort. He took a hefty bite out of a not so fresh looking apple and laughed while he chewed with his mouth open. "Hello, Grundo, my name is Bart, better known as Apple Bobbing Bart." He took another big bite of his gross looking apple. "I hear you're looking for a fantastic Halloween costume. Care to give my apple bobbing a try? Neopians have been known to find all sorts of incredible, rare, and magical items in my apple tank." His smile gave Wakka the chills, but standing there, chewing on an apple, he didn't seem *too* dangerous. She looked on longingly towards the lit up shops of the fair and down into the murky depths of his apple tank. She shrugged. "Alright, how do I play?" Bart's smile widened and he tossed his apple core into the darkness, forgotten. "It's easy, just dunk your head in, pluck out a prize, and whatever you find, you can keep." Wakka looked around, and not able to think of any logical reason why this would be a bad idea, set down her lantern, rolled up her sleeves, and plunged headfirst into the tank. Under the water, she was unable to see ANYTHING. She felt all sorts of things that did NOT feel like water or apples slipping past her face and her golden hair. She shuddered to imagine what these things could be. Finally she felt something that seemed like cloth and tugged on it with her teeth. BIG MISTAKE! As she gnawed on the unidentifiable substance, she felt a burning sensation hit her eyes. She leaped back out of the apple bin clutching at her eyes and spitting up awful tasting (what she hoped was) water. All she could hear was Bart's laughter. Wakka dug at her large orange eyes which were now watering, with her tiny purple hands. They did not clear. Tears started rolling down her cheeks, and her eyes itched and burned like there was something in them, but she couldn't quite get it out. Bart rolled with another round of laughter. "Well, you win some, you lose some." Wakka stumbled forward unable to see through her blurry vision. "But, but, what's wrong with me??? Why can't I see anything?!?" She all but ripped her space station uniform trying to pull the sleeves up to dig at her eyes. "Eh, I told you that you could keep whatever you found. What you found was a pain in the eye! It happens." He chuckled again, which was really starting to get on her last nerve. She stumbled on blindly away from the laughter, following the sounds of spooky themed music and *hopefully* the fair, and *hopefully* help. She kept bumping into things, and at least three times she tripped over rough spots on the ground, or more likely, her own two feet. Finally, she stumbled into something soft and warm, falling backwards onto her bottom. Whatever it was sneered at her. "OOF! Watch where you're going, you worthless little snot!.. Oh....."
Wakka tried to peer up at whoever it was and could see nothing. She felt so helpless and afraid. This was NOT the place to be in anything less than in top shape. 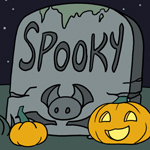 All the spookiest residents of Neopia hung around in the Haunted Woods, and it was common knowledge that anyone that was going to make trouble, was going to come out of the woods here. Legend had it that this was the very place that the Darkest Faerie herself had come from! "Ah, I see Bart has found himself another victim." A woman's voice cackled. "What? Who are you? I can't see anything! Where am I? Can you please help me?" Wakka pleaded with the woman pathetically. The woman smiled. "But of course I can help you, little Grundo... Of course. It's what I LIVE for! To help poor, unfortunate, little Neopians such as yourself!" The woman sounded all too eager but Wakka was grateful nonetheless. In her blurry state, she could make out a bright flash of lime green and violet and then the darkness returned as her vision slowly started clearing. She started checking off facts in her head, and gulped, having a strong suspicion of who her faceless savior had been. She was in the Haunted Woods, at night, there was a woman, who had magic, that burst out in lime green and purple... Unless it was some random Neopian with REALLY expensive magical items, there was only one person, or rather faerie, who could have done this. She put together all of the facts, just as her vision became clear once more, and she looked up into the dark eyes of Jhudora herself! Wakka gulped again and it took her a moment to find her voice. When she did, it was shaky, and her fear was obvious. "Um... uh... Thank... you... Miss.. Jhudora.. Miss.. Mam.. Your.. uh.. grace?" Jhudora was known to ALL Neopians, known, and feared for good reason. "But of course, little Grundo, anything to help a poor, defenseless, little Neopian, such as yourself. It is my pleasure." The smile painted across Jhudora's face did not match the friendly tone of her words. "Um, so thank you... I'll, uh, just be on my way now, Mam." She tried to smile and not let the faerie see just how afraid she'd become. This night had just gone from bad to terrible! "Oh but what's your RUSH? Why are you in such a hurry to leave? We were just getting to know one another. And I DO have a soft spot for pretty little purple Neopets. Purple and green are my favorite colors, you know." Jhudora smiled as she flipped a silky strand of violet hair back behind her shoulder. "Oh um.. It's nothing, it's just, I was on my way to the fairground to pick out a costume for Halloween..." Her voice trailed off and she realized that escaping Jhudora would not be so easy. "Ohhh! Halloween costume shopping??? GOODIE! I L-O-V-E Halloween you know! It's my FAVORITE holiday!" Jhudora's voice sounded like a Hissi crawling up Wakka's spine, and wrapping itself tightly around her throat. She choked back a squeal of terror and tried to think logically. "Oh? It is? It's one of mine too. I'm always working on Halloween so I asked for the day off a month early this year. I didn't want to miss it. I hope Halloween will be terrifying and exciting this year!" She thought maybe if she could appeal to the faerie's "good side" (that is if Jhudora even HAD a "good" side) she might be able to escape with no harm being done. Jhudora licked her lips. "Most excellent. So you came here looking for a costume did you? 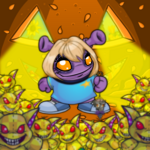 Well, Fyora may be the Queen of Faerieland, but I am the Queen of Halloween! Trust me. You're in goooood hands.... " She paused in thought. "What was your name again? You have me at a disadvantage, after all, you know who I am." She puffed up noticeably, obviously quite proud to be recognized and respected. "My name is Wakka, Miss Jhudora. I work at the space station, most of the time." The dark faerie smirked. "Of course you do. Well, follow me, and we'll get you all fixed up." Seeing no other option, she trailed behind the dark faerie through the stalls and games of the haunted fairegrounds. Neopians, petpets, and any other sentient creature in the fair gave them LOTS of space as they passed by. Wakka lowered her head and wondered what they must all be thinking. She could make out hushed and scared sounding whispers, but every time Wakka looked towards some of the chatter, everyone stopped talking very quickly. Jhudora seemed oblivious, and that made sense. She was probably used to this sort of behavior. Wakka, however, was not. They stopped briefly in front of a small shop. The sign read "Prigpants & Swolthy, Tailors". Jhudora marched through the doors like she owned the place. Not surprisingly, the two well-dressed shop keepers cowered behind the counter and said nothing to them. Jhudora began ripping at the racks of clothes, tossing garments onto the floor and making a big mess of everything. "Ugh.... NOTHING!" 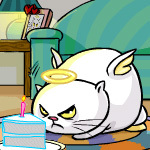 she snarled in disgust. Wakka picked up a few items; they looked well made and expensive. She chewed on the inside of her lip wondering how she would explain to Jhudora that she didn't have all that many neopoints to spend on their little shopping trip, and what Jhudora would do to her if she picked out a costume for Wakka that she was unable to afford. Leaving a messy pile of clothing on the floor and two terrified looking shop keepers, they left and trudged on to the next shop. They roamed to the edge of the fair and came to a shop that looked more like a crypt. Wakka's blood froze. The shop sign read "Halloween Paint Brushes". Jhudora smirked. "PERFECT! We'll have you spook-a-fied in no time, Wakka!" Before Wakka could stop her, Jhudora had marched through the doors and Wakka had little choice but to follow. The shop/crypt smelled terrible! It was like mold, rotting sludge, and wet paint. Jhudora impatiently rang the bell at the front counter, several times. Models of all sorts of Neopians lined the walls, all wearing dark and spooky looking costumes. A sluggish looking green Lenny, wearing a black hat, a black cape, and purple and green stockings made his way to the counter. "Yesssss.... How may I help one of my most.. valued customers?" He raised an eyebrow suspiciously, noticing Wakka. "And her guest?" "I want a Halloween costume for her..." Jhudora pointed her thumb in Wakka's general direction. "...Now... Actually, I want it five minutes ago, you incompetent nit wit. Learn how to move when you have customers waiting for you!" she shrieked. Wakka swallowed hard once again and tried to think of a way to get the situation under control. "Of courssse, Madam Jhudora. One moment, please. I think I have just the thing." He wandered off behind some dark red velvety curtains and out of sight. Jhudora spun on her heels. "Now, you'll be the scariest Neopian in no time, Wakka." She grinned maliciously. Wakka turned and saw the small sign on the front counter. "Magical Halloween Paint Brushes, only 2,200,000 neopoints! Scarily great deals for the spookiest Neopians!" Wakka gulped again, hard. She felt as though there was a giant marrow caught in her throat and she would choke on it. "Um... uh.... Miss Jhudora.. Ma'am?" Jhudora rolled her eyes. "Just spit it out, will you? I don't have all night, you know! My time is VERY valuable. You should consider yourself lucky that I was nice enough to help you and take you shopping!" Jhudora tapped her foot impatiently. "Ugh! Where IS that darn Lenny anyways?" "Um, Jhudora. Thank you, so much, for... everything... but umm... I don't, well, that is... er... " She pointed at the sign, unable to force the words out past the marrow in her throat. "Yes? It's a sign? What of it?" Wakka cringed. "Jhudora, I really love these costumes, you have GREAT taste in clothes!" Jhudora, like any intelligent creature, beamed at the compliment which she seldom received. "But I don't have two million neopoints to spend. I just work at the space station. I've never even SEEN that many neopoints outside of movies or stories!" Jhudora stood in silence for a moment. Her brow twitched and her eyes narrowed. "You mean to tell me, that you've been wasting my time?.... I do NOT like it when people waste my time...." Her voice trailed off darkly. "No, no, no! Not at all! I mean, if anyone in all of Neopia would know how to find an amazing costume, it's YOU! No contest! I just, that is, well...." Wakka couldn't think of anything else to say so she just shrugged her shoulders in defeat. "Well, then how many neopoints DO you have to spend on our little shopping spree?" Wakka pulled out her coin purse and dug around counting in her head. "Umm... About 5,000 points?" She chuckled nervously. "FIVE THOUSAND POINTS!?! What?!? Do you live in the RUBBISH DUMP?!? How on Neopia did you expect to find a decent costume for a measly five-thousand neopoints?!" she fumed. Wakka backed a few paces away and just as Jhudora finished yelling the Lenny returned with a hooded robe on a hanger and a scythe. Seeing the dark faerie on the brink of loosing her temper he inched back behind the curtain, hoping to remain unnoticed. "Well, that is.... I was going to find, maybe a mask or something, and then dig through the second hand shop and make up a costume, I guess...." As the words left her mouth she regretted them. Jhudora had probably never even heard of a "second hand" shop. She had magic and only faeries know how many neopoints to her name. Jhudora chuckled, and this time she made no attempt to hide the sinister tone in her laughter. "Oh my. Oh my, my, MY.... Now isn't that just sad and pathetic." She covered her mouth and let loose another round of unbridled laughter. She shook her head "Tsk.. tsk.. tsk... Wakka... Why didn't you just SAY so.... I would have GLADLY helped you! We're both GIRLS after all, aren't we?" Wakka REALLY didn't like the direction that this conversation was going. Now more than ever she wished she had waited for Dotra's repairs to be complete before going on this little adventure. Jhudora stormed out of the paint brush shop and beckoned Wakka to follow. When they were away from the fairgrounds, alone in the woods, Jhudora finally slowed her pace and stopped. For a moment, she looked around and listened to the quiet noises of the woods. "There now, all alone, nice and private." She grinned down at Wakka and the Grundo felt the marrow growing in her throat again. "You said that you wished this Halloween would be exciting and terrifying? I have *just* the thing for you, my dear." Jhudora began waving her hands around in circles and chanting. "Weebles and woowoos, slorgs and moogle, give this Grundo some evil Poogles!" There was a bright flash of green light and suddenly the forest and even Jhudora disappeared! Wakka found herself trapped on the inside of an over sized jack-o-lantern. Her space station uniform was covered in pumpkin goo and pumpkin seeds. Although she was in a sticky situation, she was glad that Jhudora had not come with her, and that the immediate danger seemed to have disappeared. Wakka tapped on the walls of the jack-o-lantern, noticing the hollow sound they made. "Hello? Is anybody there? Where am I?" She wondered what Jhudora had meant by "evil Poogles" and all of that scary chanting. The answer that came to her was a soft growl. She noticed a set of dark, glowing, red eyes, then another, and another. Slowly, out of seemingly no where, the jack-o-lantern began to fill up with yellow Poogles. Each had a set of glowing red eyes, and a mouth full of fangs. The Poogles inched their way towards her, snarling and growling. Wakka stepped backwards until she had backed into the side of the jack-o-lantern. The evil Poogles crept closer. Some foamed at the mouth, others licked their lips, and others just smiled, exposing rows of razor sharp pointy teeth. Wakka began pounding on the sides of the jack-o-lantern as hard as she could, her heart racing. "LET ME OUT! LET ME OUT! SOMEONE, PLEASE HELP ME!?!" In the distance she could hear Jhudora's laughter over the growling of the evil Poogles. "Be careful what you wish for, little Grundo. Your wish just might come true! HA HA HA HA HA!... Happy Halloween!"